Party Season Skin Prep featuring Skinesis, DHC, Pixi and more! I've been rotating my makeup to get my festive picks ready but the key to makeup looking good is actually in well prepped skin, in my opinion, so before showing you the makeup I'll be wearing over the festive season, I wanted to show you the skincare products I'll be using. Late nights, rich food, more food that usual and fizzy drinks will all take their toll on my skin so I will be maintaining my current skincare routine but also using extra products to ensure it is plump, hydrated, clear and (hopefully) glowing. Pixi Glow Tonic has made it's way back into my routine and it's an essential for the festive season because it is gentle enough to be used daily but effective enough to exfoliate the skin, leaving it smooth, soft and glowing. Skinesis Intense Hydrating Booster is the perfect treatment for soothing and hydrating the skin. It is packed with hyaluronic acid and it also contains rose water - both of which combine to leave my skin looking calm and feeling soft and plump. It can be used as a serum or mixed with moisturiser and I know I can depend on it to replenish my skin over the next few weeks of excess. Estée Lauder Advanced Night Repair is a product that is an absolute essential for me because it heals, hydrates, soothes, plumps, strengthens and repairs the skin overnight. Consistent use of this will prevent damage to my skin so this will be a non-negotiable over the next few weeks, no matter what product I layer over it. DHC Beauty Lift Eye Care Essence Roll On is a product I have been using in the mornings over the past few weeks and it works wonders on tired and puffy eyes because it's cooling and soothing. Because it's a serum/essence, it isn't at all heavy so it's perfect for under concealer as it won't disturb it. It has 3 metal rollerballs that help with lymphatic drainage, which reduces puffiness around the eye area - ideal for the morning after late nights! A Christmas season essential. DHC Astaxanthin All-in-one Gel is packed full of skin loving ingredients. Astaxanthin is an ingredient I hadn't heard of before but it is a super anti-oxidant that is said to be 6000 times more powerful than Vitamin C and it is derived from algae. This moisturiser also contains hyaluronic acid and collagen and the combination of all of these ingredients results in firm, plump and hydrated skin. This will be my morning moisturiser for the next few weeks. It's no secret that I am a huge face mask fan and I have three that I will be relying on - Omorovicza Gold Hydralifting Mask is perfect for healing tired and stressed skin but it also nourishes and firms the skin so it is a great pick me up mask. For intense hydration and nourishment, I will be using Glamglow Thirstymud Mask, which I leave on overnight to really maximise the effects and I always wake up to soft, plump skin. It has been a staple for me since it launched in 2014. I will be rotating that with Glow Recipe Watermelon Sleeping Mask, to ensure I wake up to glowing, renewed and clear skin. Finally, I had to include Sarah Chapman 3D Moisture Infusion Sheet Masks because even when I'm at my worst, these make my skin look 5 years younger! They are amazing at plumping the skin and making it look firmer. My skincare products will be working hard while I party hard (as if, I haven't partied hard in years!!). I am hoping that the combination of all of these products, in conjunction with my usual skincare routine, will help to banish all signs of the excesses of the party season. 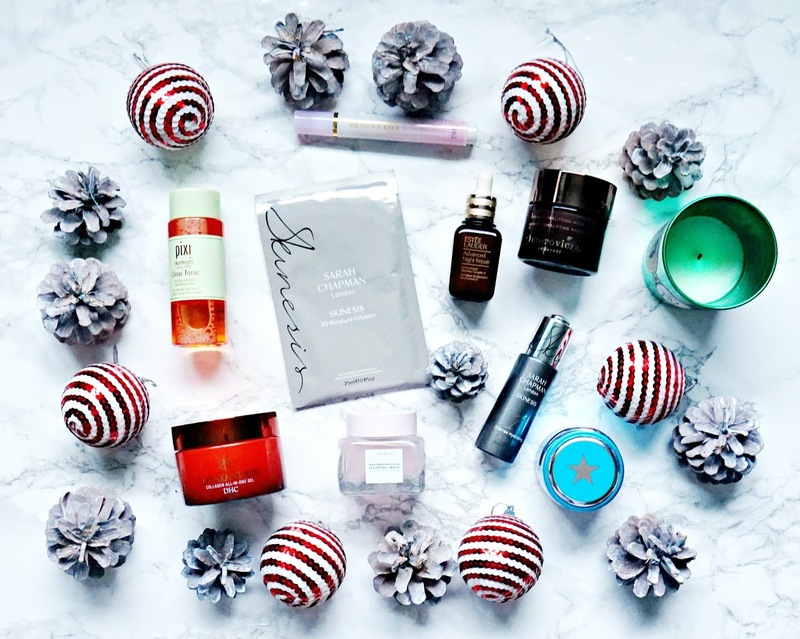 Do you like to be a little extra with your skincare over the festive season? I'd love to hear! All products are bought by me, unless otherwise stated. The DHC products and Pixi Glow Tonic were kindly sent to me. This post is not sponsored. Opinion is always my own.